Researchers have discovered the first direct evidence of cosmic inflation, confirming a deep connection between quantum mechanics and general relativity. Cambridge, Massachusetts – Almost 14 billion years ago, the universe we inhabit burst into existence in an extraordinary event that initiated the Big Bang. In the first fleeting fraction of a second, the universe expanded exponentially, stretching far beyond the view of our best telescopes. All this, of course, was just theory. These groundbreaking results came from observations by the BICEP2 telescope of the cosmic microwave background — a faint glow left over from the Big Bang. Tiny fluctuations in this afterglow provide clues to conditions in the early universe. For example, small differences in temperature across the sky show where parts of the universe were denser, eventually condensing into galaxies and galactic clusters. “Our team hunted for a special type of polarization called ‘B-modes,’ which represents a twisting or ‘curl’ pattern in the polarized orientations of the ancient light,” said co-leader Jamie Bock (Caltech/JPL). Gravitational waves squeeze space as they travel, and this squeezing produces a distinct pattern in the cosmic microwave background. 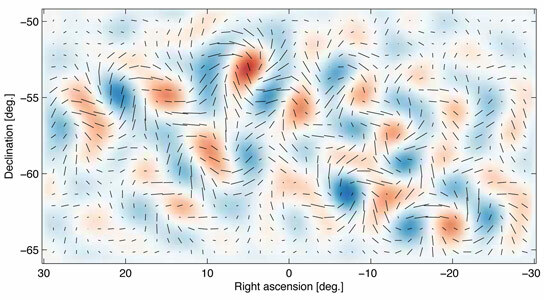 Gravitational waves have a “handedness,” much like light waves, and can have left- and right-handed polarizations. 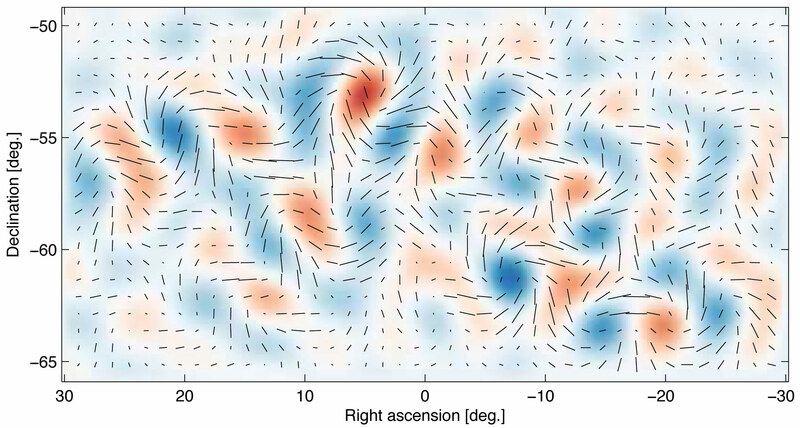 “The swirly B-mode pattern is a unique signature of gravitational waves because of their handedness. This is the first direct image of gravitational waves across the primordial sky,” said co-leader Chao-Lin Kuo (Stanford/SLAC). BICEP2 is the second stage of a coordinated program, the BICEP and Keck Array experiments, which has a co-PI structure. The four PIs are John Kovac (Harvard), Clem Pryke (UMN), Jamie Bock (Caltech/JPL), and Chao-Lin Kuo (Stanford/SLAC). All have worked together on the present result, along with talented teams of students and scientists. Other major collaborating institutions for BICEP2 include the University of California at San Diego, the University of British Columbia, the National Institute of Standards and Technology, the University of Toronto, Cardiff University, Commissariat à l’Energie Atomique. BICEP2 is funded by the National Science Foundation (NSF). NSF also runs the South Pole Station where BICEP2 and the other telescopes used in this work are located. The Keck Foundation also contributed major funding for the construction of the team’s telescopes. NASA, JPL, and the Moore Foundation generously supported the development of the ultra-sensitive detector arrays that made these measurements possible. 1 Comment on "Researchers Discover the First Direct Evidence of Cosmic Inflation"
OK – I’m game. WHY do we exist?